December 3, 2010 — I’d like to see the alternate timeline where Milton Hershey went into auto parts manufacturing instead of chocolate making. See it, mind you, not live in it. I like our timeline just swell since his choice of profession gave our world Hershey bars, Kisses, and Reese’s peanut butter cups. You know, much of the stuff that solves the whole theological problem of evil. 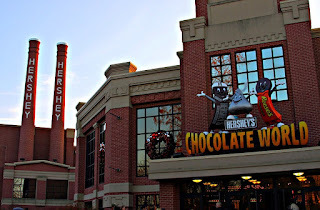 It also gave us Hershey, PA, that real-life Candy Land filled with multiple chocolate-themed attractions that candy-coat the area around Hershey’s corporate headquarters. Now, right off the bat, you need to know that I hate it when I’m forced to use sports idioms. 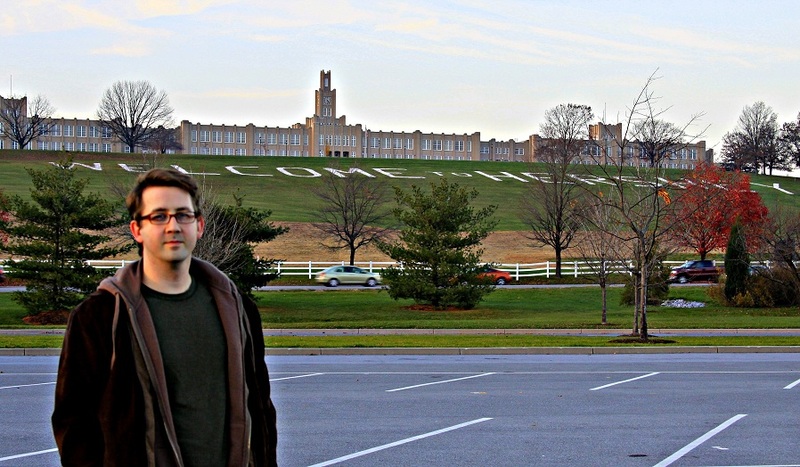 Also, that I’m not your best guide for Hershey, PA. I mean, I’ve never even been to its theme park despite living just a couple of hours from it for most of my life. Nor have I been to the official museum or taken the factory tour. 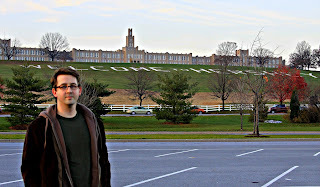 In fact, Hershey, PA, has so far always just been a passing-through point for me. 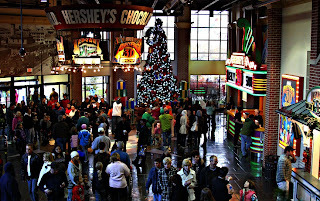 But the reason I even pass through it is because of one place: Hershey’s Chocolate World. 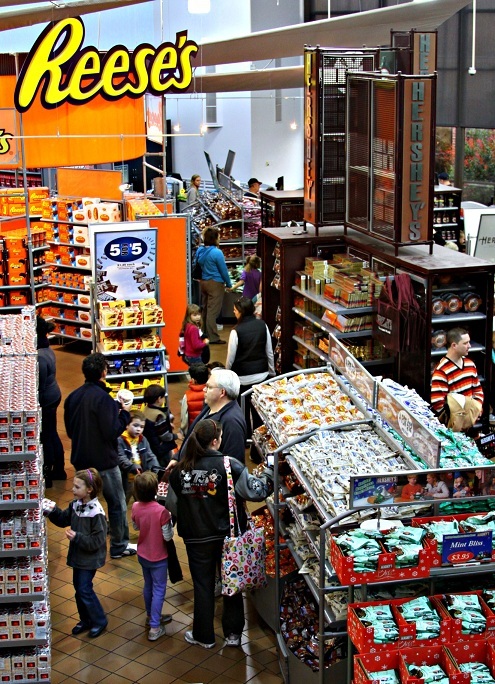 Short version: It’s a gigantic candy-filled gift shop dedicated to the Hershey’s brand. Long version: Well, that started four paragraphs ago. 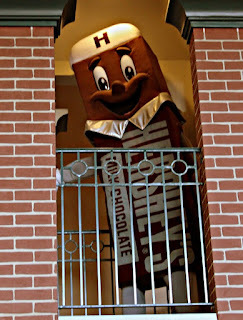 Hershey’s Chocolate World lies right in the dark chocolate shadow of the sprawling hilltop headquarters of the famous candy brand and shares a parking lot with its Hersheypark neighbor. Calling it a mere gift shop isn’t completely accurate. Calling it much more than that is somewhat problematic. 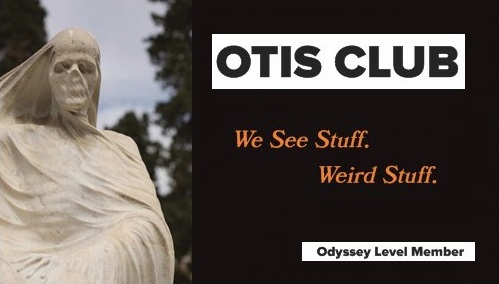 On the official site, they call it an attraction, and I’ll go with that. After all, I am attracted to the place. You don’t have to spend money (parking and entry is free), there’s no hassle to get in, there’s plenty of stuff to keep you occupied, and the whole place is made of chocolate…more or less. 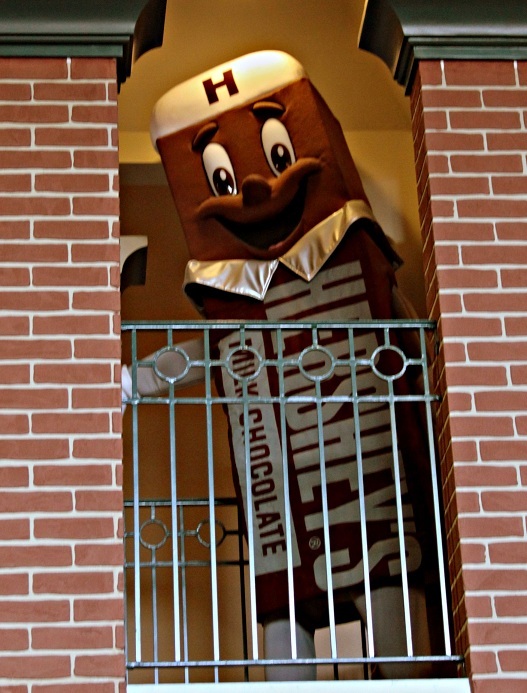 Above the entrance to Chocolate World, enthusiastically anthropomorphic versions of the three candies mentioned in the first paragraph welcome you into the clock tower-topped building. Upon entering, you have your choice of activities. 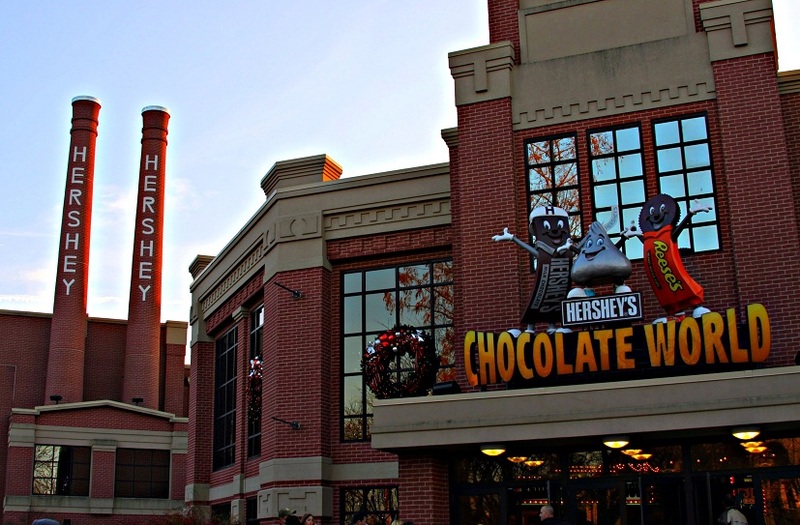 You can make your own candy bar with your own custom-designed wrapper, see a 4D movie, grab a meal at the food court or some sweets at the bakery, or sign up for a trolley tour of the town of Hershey itself. It’s actually all pretty reasonably priced, but you can also just do the free stuff and take off like I’ve done the few occasions that I’ve visited. I skate pretty cheaply sometimes. But that free stuff includes the Great American Chocolate Tour, an automated cart ride that takes you through a mock chocolate factory where singing cows and a hidden narrator explain the process of chocolate making, from harvesting the bean to wrapping the final product. 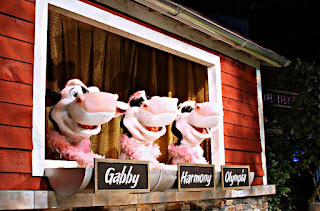 It’s realistic enough (other than the singing cows) that the first time I went through I had to think hard about whether I was watching real chocolate being mixed and formed. They also pipe the smell of chocolate throughout, which definitely didn’t hurt the illusion. Afterwards, you get a free sample. The whole thing is more enjoyable than it should be, honestly. The main part of Chocolate World is the actual gift shop. Filled with everything you’d expect, plus exclusive Hershey’s candy and merchandise, you’ll come across stuff like one-pound Reese’s cups and giant chocolate Kisses filled with smaller chocolate Kisses, Hershey’s-branded clothes and stuffed animals, and all the other things you instinctually grab before realizing steps later that you don’t need any of it. No souvenir toothbrushes, though. 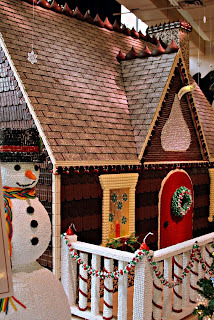 Oh, to be a dentist in Hershey, PA.
Of course, at Christmas, when candy takes on a starring role in all of our lives, there’s much more to see and experience. For instance, all the above-mentioned attractions get Yule-died, and a large candy-decorated Christmas tree is erected inside. 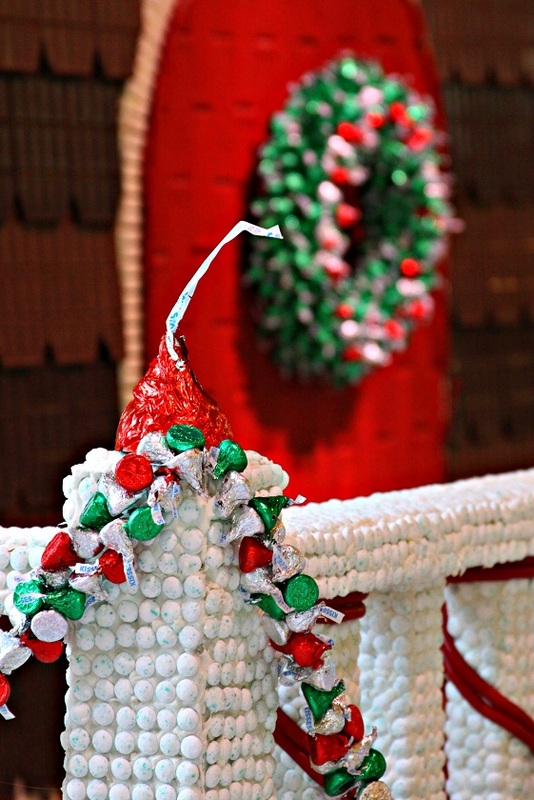 In the gift shop area, Christmas-themed treats are everywhere. 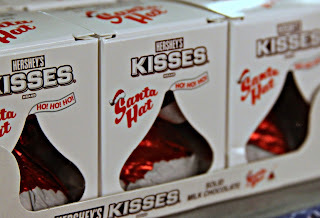 Large Kisses in Santa-hat foil, Reese’s Christmas trees, York Peppermint Patties in wreath-adorned wrappers, cookies n’ cream Santas, all the holiday-flavored Kisses (Irish crème, hot cocoa, mint truffle, and my favorite, candy cane, to name a few). Santa’s there, of course, with a welcoming lap and a helper who’ll steal your baby’s soul with his camera, and this year they built a shed-sized house covered completely in candy. 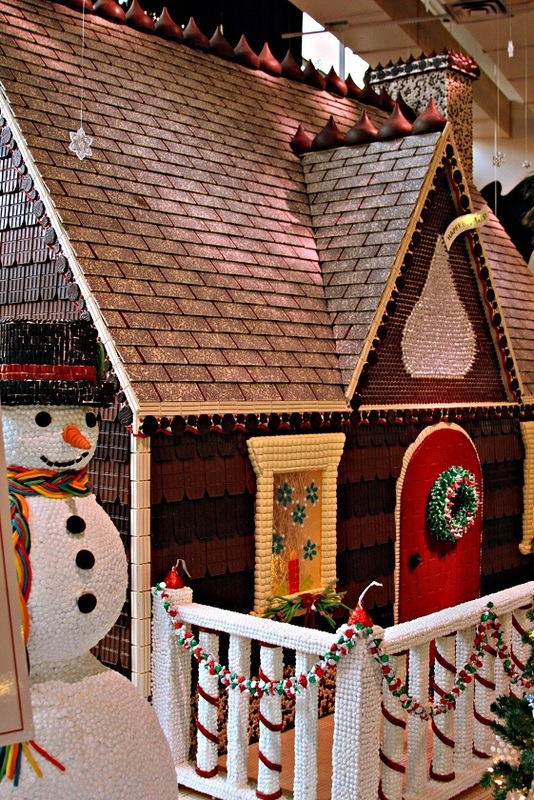 Topped with gigantic Kisses, shingled with large slabs of cookies n’ cream chocolate, sided with Hershey bars, and front-porched with Kit Kats, this Hanzel and Gretel trap was worth the admission non-price just by itself. It even had a snowman made of 40 pounds of Ice Breakers mints, with a rainbow Twizzler scarf, Reese’s cup buttons, and Peppermint Patty eyes. That’s almost better than some magic in an old silk hat. Elsewhere in the Hershey’s complex, you’ll find other ways to celebrate Christmas, such as Christmas Candylane in Hersheypark and Sweet Lights, a drive-through light festival. I actually did go to that latter, but will hold off writing about it so that I can economically combine it in an article with another drive-through light festival I visited around the same time, the Oglebay Winter Festival of Lights in Wheeling, WV. Just because they're okay with wasteful energy expenditures doesn't mean I have to be. Back to the topic (so that I can end it), I generally find Hershey’s Chocolate World to be much like their eponymous chocolate bars. Among the range of nougat-stuffed, peanut-adorned, caramel-centered candy bars on the market, you rarely choose a plain old Hershey bar. But when those silly Fates arrange to put one in your hand, you remember just how good the things really are. And then you forget again. 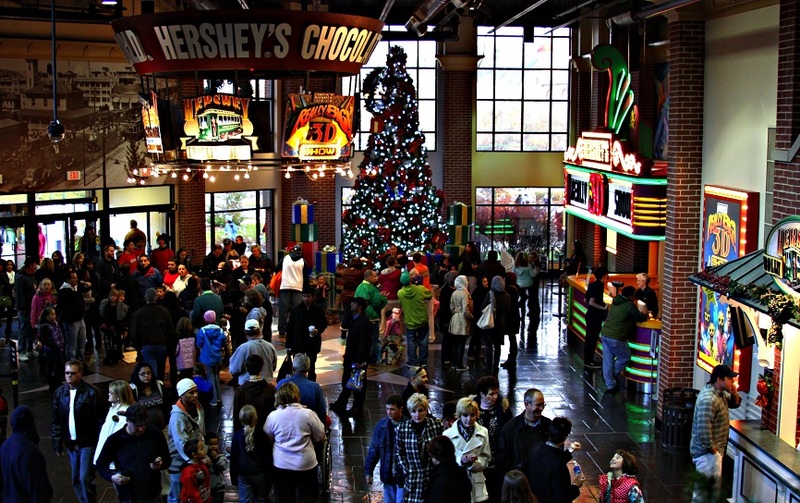 Hershey’s Chocolate World is a great place for a road-trip pit-stop, if you happen to think about it, especially at Christmas time.